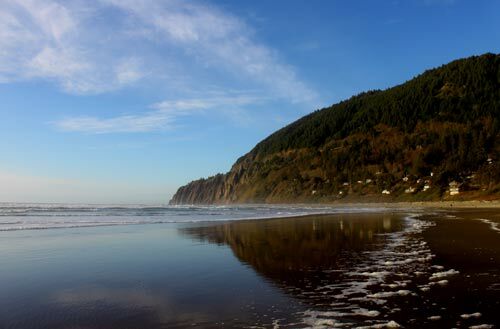 (Manzanita, Oregon) – You could literally spend days just bouncing around the beaches and the nooks and crannies of this north Oregon coast town and never get bored. A quiet but quirky sense of the laidback, along with a few upscale high points and moments of culinary flashiness inhabit this pretty place, all alongside the seemingly endless rugged surprises found in nature. Hiking trails, mountain scenery, soaring cliffs of intricate and engaging shapes, thick forests and then there are those beaches – oh, the beaches of soft sand that really do stretch as far as the eye can see. 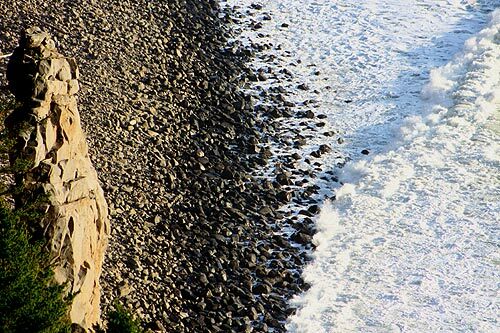 It's the viewpoints that often amaze the most, and for good reason. 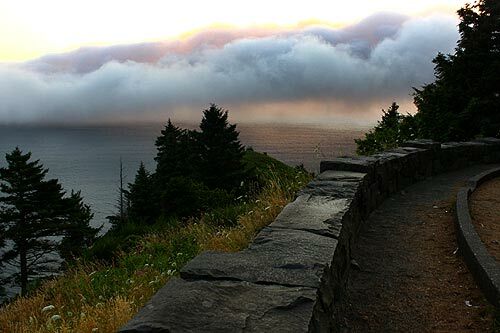 Neahkahnie Mountain is one of the most spectacular and photogenic spots on the entire Oregon coast, possibly – and only possibly – rivaled by Cape Foulweather near Depoe Bay and the overlooks near Heceta Head a ways south of Yachats. 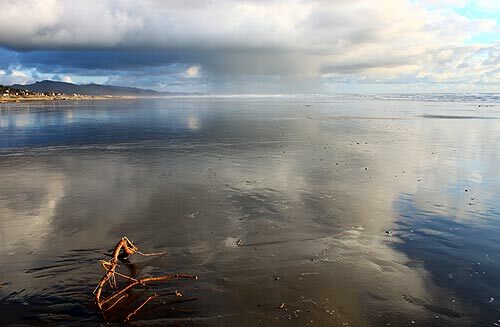 The views from Neahkahnie come in many shapes and sizes. And colors as well. 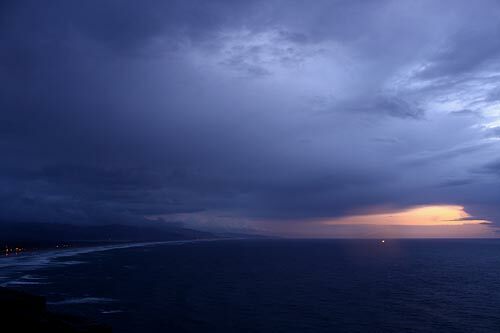 Sometimes it's the clouds that interact with that always-stunning sea below. 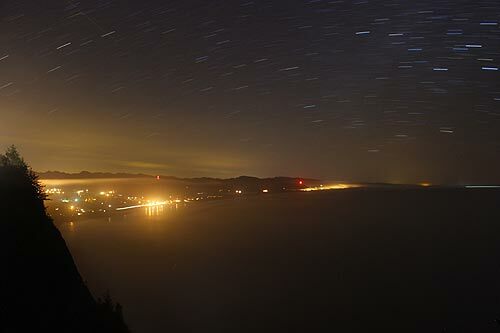 Other times, even the nighttime views from here sparkle in unique ways that could make other Oregon coast viewpoints seriously jealous, if they were so inclined to the possession of emotion somehow. 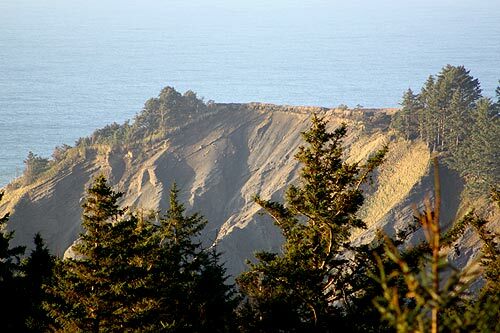 Just north of the big Neahkahnie viewpoints are the wilderness and cliff-hanger trails of Cape Falcon, which traipse along these precarious edges and ledges to views that downright boggle the mind at all times. 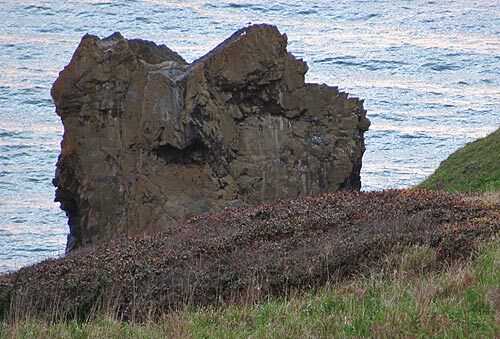 They take several miles of hiking to get to and often include heavy inclines. Among the striking discoveries are freaky rocky structures like this one, called Cube Rock. It looks much like something left over from another civilization. 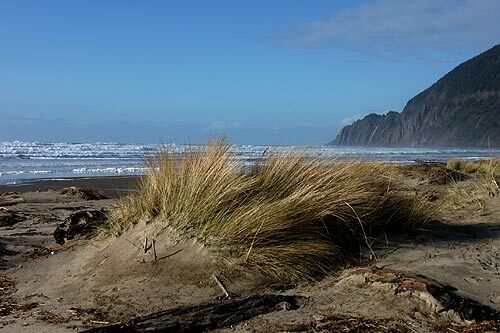 Down on the ground, the cozy, comfy sands of Manzanita dead-end at the ragged cliffs of Neakahnie to the north. 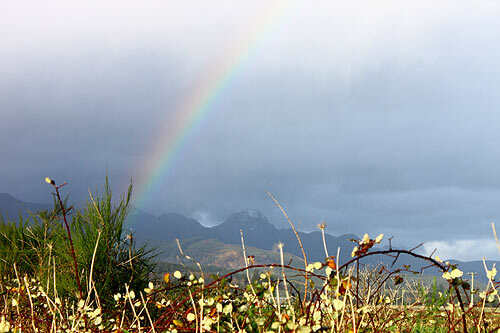 There, the soaring tip of Neahkahnie Mountain – about 1600 feet high – beckons you not only with its silent challenge to climb it, but that familiar mound shape also grabs the eye for all sorts of reasons and during all kinds of seasons. Look to the south and you won't see the end of the sands. 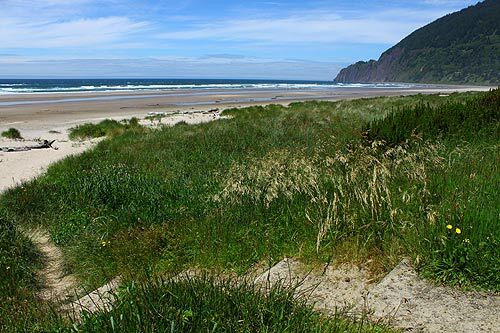 They go on way past Nehalem Bay State Park and then onto the Nehalem Bay spit, ending a few miles past. But you might see absolutely stunning stuff like this in those sands. The beaches here change often. All manner of surprises wash up here or take shape here. This beach was even known for producing mysterious chunks of ancient beeswax which apparently came from a Spanish Galleon that crashed near here in the 1700's. 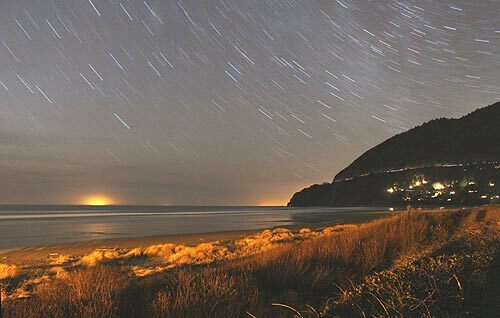 Then, there are the wild sights Manzanita's beach can produce at night. 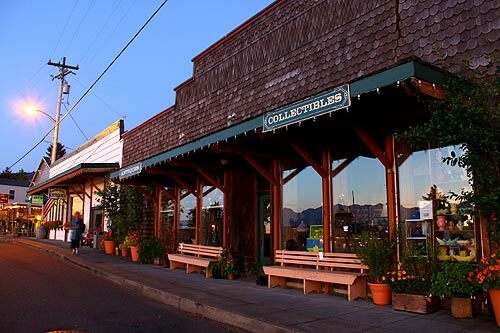 While the beach is often the main attraction here, don't pass up exploring other parts of the Nehalem Bay, like the tiny towns of Nehalem and Wheeler, with their ingenious little quirky sides, a veritable flood of fascinating antique shops and that engaging bay. Another huge attraction here is the Nehalem Bay Winery, which has put the fun back in wine tasting with a truly kooky and unique approach to the fine art of being a vintner. They also host major festivals in the summer, such as a reggae fest and the big bluegrass one every August. 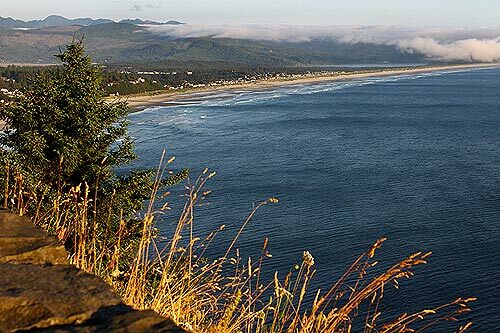 To find lodging or dining in Manzanita or the Nehalem Bay area, see below.